It seemed like only a few moments passed between the time we ordered our pizza Margarita and its arrival sizzling hot at the table. Light, crisp and full of flavor, Michele said it was the best pizza she had eaten since Naples. Rosario, one of the owners whom we had met before came by to see how we liked the pizza and introduced us to the pizzaiolo, Roberto Caporuscio. Roberto, who is a wealth of knowledge about pizza, is from Campania and has a passion for Neapolitan style pizza and trained and worked in Naples. He has also made pizza in Denver, Chicago, Pittsburgh and NJ, among other places. He asked us which pizza places we liked in NYC and Naples and we realized that we liked many of the same places. Meanwhile, we had finished eating and Keste was getting busy. Roberto asked us if we would like to come back to see how he made the pizza from scratch. We gave him an enthusiastic Yes! And made a date for the following Monday. Roberto’s experience making pizza in Italy and around the US taught him that despite the common belief, the water did not make a big difference in the f inished pie. The temperature and humidity were more important because these would affect how long the dough takes to rise. He does not use a “biga” starter. He only uses fresh natural cake yeast that must be kept in the refrigerator. Dry yeast does not do the job and can leave spots in the pizza. He uses a very small amount of yeast, 1 gram per liter of water, and lets the dough rise very slowly. Roberto uses “double zero” Antimo Caputo flour in 55 lb bags. It is made especially for pizza from seven different kinds of wheat. The wheat is ground very slowly so as not to damage the flour and the nutrients. This flour gives you dough that is easier to stretch and the slow rise gives you more flavor and makes it lighter. Roberto does not put the dough in the refrigerator but leaves it out to rise for 18 to 24 hours. The flour, water, salt and yeast are mixed in a special machine that has two arms and moves very slowly. The slow movement mixes the dough without heat buildup. It takes about 20 minutes for it to be ready. The dough remains in the machine until Roberto is ready to transfer it to a table where it continues to rise. When it is ready, the dough is shaped into 9.5 ounce balls. The shaping method is the same for making mozzarella. The finished balls are put into plastic boxes to rise. Roberto tried to find wooden boxes but did not like any of them. It takes about 20 minutes to shape the mass into individual balls. The finished dough is so soft, you might expect it to stick to your hands, but it does not. Roberto makes sure every ball of dough is perfectly round because any holes or gaps would prevent the pizzas from lying flat in the oven an d they would not bake properly. When it is time to make a pizza, Roberto takes a ball of dough and with his fingers spreads it into a disk. He rotates the disk by quarter turns--it takes less than a minute to reach its final shape. He makes sure that the pizza is not too thin in the middle, if it is the cornicione or rim will be too thick. I have never seen a pizzaiolo in Naples toss the pizza in the air, but I had to ask anyway. Roberto gave me a look and said that the dough is not to play with, it is food! Next he puts on the sauce, starting in the middle and working in circles toward the edges-- not too much sauce in the middle. Buffalo mozzarella is then added and some basil and a touch of olive oil. The wood burning oven is 900 degrees. He stretchers the dough a little more before putting it on the peel. I took out my watch and timed it. A perfect Pizza Margarita was done in only 45 seconds. From the time Roberto touches the dough and to the time the pizza arrives at your table is less than five minutes! 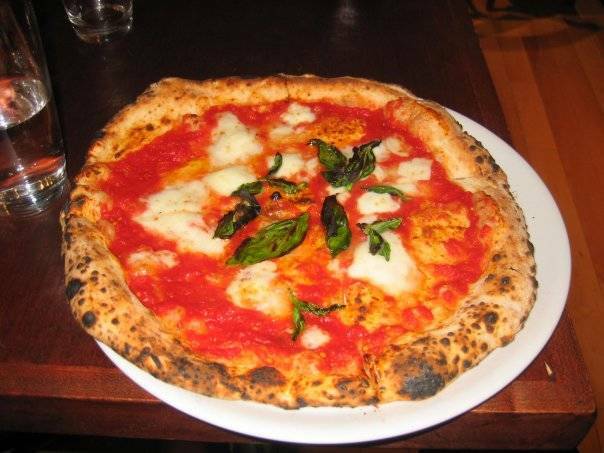 Like the classic Neapolitan pizza, it is 9-10 inches and has a crust that is neither too thin nor too thick. It can be folded in half and then folded again into quarters, without cracking or breaking the crust. Only the edge, called the cornicione, is crisp, though it is also chewy. Roberto grew up on a farm, and would milk the cows and make cheese. He told us a story of feeding the cows tomato skins so the milk had a pink tinge to illustrate for us that what you feed the cows determines what the cheese will taste like. He loves cheese and uses different types on his pizzas. He says that he varies his pizza toppings as long as they make sense. Once a customer asked him to make a pizza with pineapple as a topping. He considered it an insult and refused. Would you have sushi and ask the chef to put Mozzarella on it? In addition to the superb Margarita, we also tried Roberto’s Roman style pizza made with thin sliced potatoes, and the Mastro Nicola which is Roberto’s interpretation of the earliest Neapolitan pie, before tomatoes were introduced to Italy. It was topped with pecorino, herbs and lard.